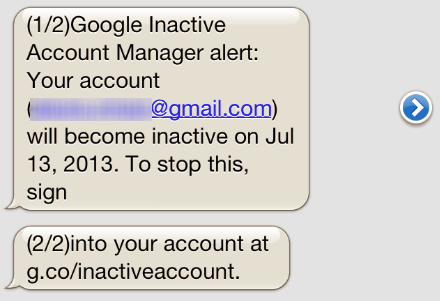 What Happens After You’ve Set Up Google Inactive Account Manager? 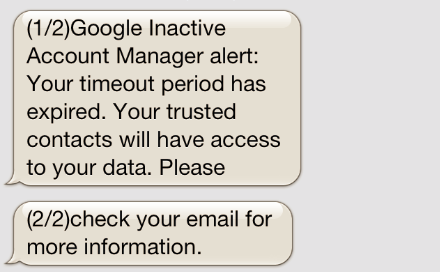 Google’s Inactive Account Manager allows you to designate a person to be notified if your Google account has been inactive for 3 or more months. You can also elect for Google to share your data with that contact at that time. Let’s take a look at what happens after the inactivity period is reached and consider what security precautions you might need to take when using this feature. I also specified the subject and contents of the email message that Google would send to the trusted contact when the account becomes inactive. In addition, I provided a mobile phone number where Google would send text message alerts regarding the inactive account. I told Google to “Remind me that Inactive Account Manager is enabled.” I chose not to ask Google to delete the account after it expires. Then, I waited 3 months, avoiding the use of my test account. I wanted to see what will happen once it reaches the state of inactivity. The email message explained that to avoid expiration, the user needed to sign into Google and edit Inactive Account Manager settings. Google sent another set of alerts 11 days later, then a week after that, and again 5 days after that. Google’s message provided a link to obtain the data from the expired account and stated that I have been given access to download it over the next 3 months. The data was available as a Zip file archive, similar to how Google provides it user the Google Takeout service. I retained access to the expired account’s data for about 24 hours after my test user logged into Google and reactivated the account. The data that I could access during that time was a snapshot in time, taken on the date when the account expired. The export didn’t include new data generated by the reactivated account afterwards. After the test user logged into the account, there was no warning about the trusted contact having accessed the data when the account expired. If enabling Google’s Inactive Account Manager and reaching the inactivity state, you should assume that the designated person exported your data. As you can see, Google built safeguards to avoid the expired account’s data being shared accidentally or becoming available to the wrong party. This process entails sending several email and SMS notifications, which could be misused by attackers to create phishing scams. If you or people in your organizations rely on Google accounts, educate them about the flow of information associated with Inactive Account Manager and remind them to interact solely with Google’s SSL-enabled websites regarding this feature.